Convert MP4 to AVI and other 1000+ video formats on Windows/Mac. Edit MP4 videos with trimming, cropping, rotating, watermarks, etc. Download videos from YouTube and other video sharing sites easily and convert to AVI. Versatile toolbox combines with Screen Recorder, Video Compressor, Fix Video Metadata, etc. 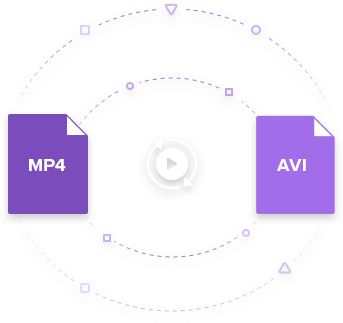 MP4, as well as AVI, are two of the most commonly used video formats. MP4, developed by MPEG is a compressed container file format that can contain video, audio, images, and subtitles. The format is commonly used for sharing videos over the web. Talking about AVI, the short form of Audio Video Interleave is a multimedia container format developed by Microsoft. The format can contain video as well as audio in a single file and support its multiple streaming. There are many situations when you would need to convert MP4 to AVI on Mac and vice versa. Some common ones include playing your favorite MP4 videos on AVI compatible devices or mobile phones, sharing with your friends who have AVI compatible player like Windows Media Player. So if you are looking for solutions to convert MP4 to AVI Mac (Mojave Included) quickly and flawlessly, read below. Using converter is one of the best solutions for converting file formats and if you are looking for a professional MP4 to AVI Converter on Mac that allows flawless and effortless conversion, then Wondershare UniConverter for Mac (originally Wondershare Video Converter Ultimate for Mac) is the name to trust for. The software allows fast speed conversion while retaining the original video quality. In addition to MP4 and AVI, other commonly used formats like WMV, FLV, 3GP, and more are also supported for conversion. Wide format support: More than 1000 popular formats are supported by the software so that there is no need for any third party conversion. Ultra-fast speed: The APEXTRANS technology of the software makes the conversion process 30 times faster than other software. Preset device support: Allows converting MP4 to AVI as well as other formats to present device compatible formats. Batch MP4 to AVI Conversion: Allows adding multiple files to the software for batch conversion with just a click. Video Editing: Supports an array of editing features like cropping, trimming videos, adding subtitles, applying effects, etc. Download and record videos: The software allows downloading as well as recording videos from more than 10,000 sites. The downloaded videos can also be converted to be the required format. Burn DVD: It allows burning videos to DVD or Blu-ray disc with free DVD templates. Supported OS: Mac OS 10.14 (Mojave), 10.13, 10.12, 10.11, 10.10, 10.9, 10.8, 10.7, 10.6, Windows 10/8/7/2003/Vista/XP. Step 1 Launch the MP4 to AVI Mac converter and add MP4 files. Download, install and launch Wondershare UniConverter for Mac (originally Wondershare Video Converter Ultimate for Mac) on your Mac. Simply drag and drop the desired MP4 files to the software interface. Or click Add Files to browse and add MP4 files from your Mac. Step 2 Select AVI format for the AVI to MP4 conversion. You can click drop-down icon beside Convert all tasks to:, and then select AVI and the related resolution from the Video tab as the desired format. Please note that you can click Create Custom to build your output format for customized bitrate, frame rate, encoder, etc. Step 3 Start converting AVI to MP4 on Mac. Before the conversion, you're optional to edit your video like trimming unwanted part, adding subtitles by clicking one of the editing icons under the video thumbnail. Finally, click Convert All to start the conversion process. After a while, the added MP4 files will be successfully converted to AVI. You can get the converted files by tapping the Output icon at the bottom of the main interface. If you are looking for a free converter, then Wondershare Free Video Converter for Mac is a good choice. This software is free to use and allows converting videos and audio files to formats which are compatible with iOS and other devices. The program supports editing features like cropping, merging, trimming, rotating and others. Wondershare Free Video Converter for Mac also allows downloading videos from YouTube and convert them to different formats. Step 1: Download, install and launch Wondershare free AVI converter on your Mac. Step 2: Drag and drop the desired MP4 files to the software interface. You can also click Add Files > Load Media Files and browse MP4 file on your Mac. Step 3: Click Convert all tasks to: to enter the Format window, select AVI and the resolution from the Video tab. Step 4: Click Convert All to start the conversion process. The MP4 files will be successfully converted to AVI format. If the process of downloading, installing and registering the software is a tedious task for you, then you can opt for an online converter. There are various online converters that support a decent list of formats for conversion purpose. The majority of these online converters are free and simple to use. 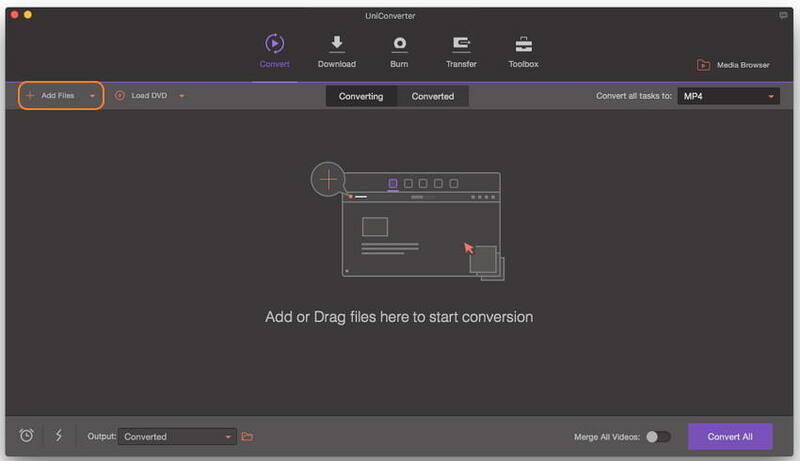 One such online converter that allows converting MP4 to AVI on Mac is Online UniConverter (originally Media.io). 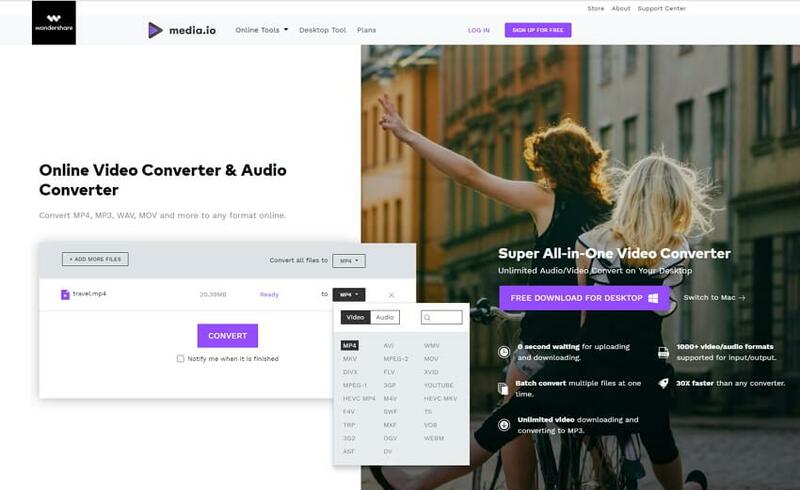 The converter has simple to use interface, supports an array of video, audio formats, allows uploading up to 100MB of a file. The converted files can be directly downloaded to your computer or be saved to Dropbox. Step 1: Open https://www.media.io/ on your Mac. Step 2: Click the Drag & Drop or Hit to Add File button to browse for the desired MP4 file on your Mac. Step 3: Click the drop-down icon and select AVI under the Video tab as the output format. Step 4: Tap the CONVERT button, and the file will be converted online. You can click the DOWNLOAD ALL button to get the converted files. Above listed are 3 methods to convert MP4 to AVI on Mac. Each of these solutions has their associated pros and cons. Depending upon your requirements related to a number of files, conversion speed, and additional features, you can opt for the most suitable method. Given below is a comparison table that will help you to decide the apt software as per your needs. Size Limitation for Conversion No, as large as you want No, as large as you want Yes, 100MB at most. Considering the features, it can be concluded that Wondershare UniConverter (originally Wondershare Video Converter Ultimate) is the best MP4 to AVI Converter Mac. The software is quick, flawless and allows converting multiple files at a time. So, try it for free now.